Helwan is foaming at the mouth. Literally. Sometimes he blows impressive pink chewing gum-like bubbles, but without the strawberry taste. Helwan's in rut and he's the lead camel, our Bedouin guide Salem explains. He has come to pick us up in Rum Village with Helwan (his own camel) and two other camels, Belhan and Waraan. Mounting a camel isn't so easy. Even lying down they are relatively high, and then the Bedouin saddle makes them even higher. Once you have folded your legs around that saddle (think lotus position on stilts) the camel is given a sign to stand up which it does in stages throwing you to the front and to the back or the other way round, anyway somewhere where you don't expect to be thrown. And sitting up there finally the ground seems rather far away. Belhan, Natascha's camel, is a male, too, and Helwan's rut makes him nervous and a little bit aggressive. He starts jumping around and Natascha has a hard time holding on to his back. How embarrassing – we are ten minutes into our one day camel ride in the desert of Wadi Rum in Jordan, and one of us is already falling off the camel! But with a rope through his nose (quite uncomfortable, we imagine) Belhan gets more quiet and we start on our desert trip. Our little three-camel caravan strides through the quiet desert of Wadi Rum. In 2011 the desert became a mixed natural and cultural UNESCO World Heritage site, due to its varied desert landscape and its permanent human occupation for 12 000 years. In one day we manage only to see a tiny bit of the 74 000 ha large sand area. The Wadi Rum desert is not primarily yellow and brownish (like the Sahara or the Taklamakan) but different shades of red and pink alternate and sandstone formations make for a varied landscape. After a long lunch break we make our way to the remains of the T.E. Lawrence house. The British officer – "Lawrence of Arabia" – passed through this area several times during the Arab Revolt of 1917–18. Suddenly we hear engines roaring through the tranquillity of the desert: Five tourist jeeps pass by, flashing their cameras at us. We try to keep our posture on those unsteady camels although clearly we can't compete with Salem in his white Bedouin garb and with his small moustache for T.E. Lawrence authenticity. In the evening Salem cooks a fantastic meal at an open fire out in the desert. We watch an extraordinary sunset and get teary eyes - on account of the burning smoke of the campfire. Although the setting is quite romantic, we get a bit bored (it is too dark to read) and are glad when it is time to crawl into our sleeping bags under the stars. The next morning a jeep brings us back to the village of Wadi Rum and we spend the day climbing a few routes on one of the sandstone cliffs. It was our first longer camel ride through a desert and we really enjoyed the fact that all three of us were on a camel (on all the other camel rides we did later, the guide usually walked). This way we could go quite fast, which was not always easy but a lot of fun. On the other hand we think that one day is not enough for such a big area as Wadi Rum, and there are also a lot of petroglyphs to see if you have a bit more time. We clearly want to come back for that, and for more climbing perhaps. Wadi Rum is about 25 km off the main road from Amman to Aqaba, and around 60 km from Aqaba. Buses are not exactly frequent but run every day. 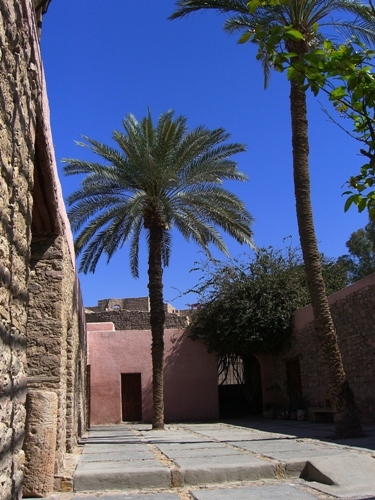 In the mid-tenth century, the small town of Aila on the Red Sea coast went into decline. “We suddenly find luxury goods such as imported Chinese ceramics, but at the same time a lot of rubbish and appalling housing conditions,” archaeologists say. They interpret this as evidence for a widening gap between rich and poor resulting in social unrest in this early Muslim settlement. An earthquake in 1068 and the easy conquest by a bunch of crusaders then sealed the fate of the town. Today, the modern port and border town of Aqaba has grown here, bustling with traders and tourists. During our one month in Jordan we also found a widening gap between rich and poor, educated and uneducated and between conflicting ideologies. They indicate, we think, social upheavals that are accompanied by vast changes in values – or, more often, a complete loss of values. On the one hand, conservative traditions clearly still dominate society but on the other hand they lose their meaning to many. Among the Bedouins living in the vast deserts of southern Jordan, life-styles seem to have changed especially fast. “A camel is a man’s best friend – I bought my first camel when I was 15.” Salem is now 23 and hopes to find a good wife soon.“ I wouldn’t mind if she had her own camel,” he says generously. Then he checks his two mobile phones while turning the potatoes in the open fire. They are wrapped in aluminium foil: this progress shortens the cooking time by half. In Salem, we were lucky to have found a guide we felt comfortable with, being alone in the desert. For many of the younger Bedouins in touristy places like Petra or Wadi Rum were ill-mannered and importunate, especially towards Western women. To some extent, Western women who encourage such behaviour are to blame for this (although it was beyond us why they would – most of these guys weren’t even charming or handsome). But we saw more women who felt obviously uncomfortable and didn’t protest at such behaviour. “Islam became stronger during the last years. 10 years ago, fewer women were wearing headscarves, and almost none were completely veiled,” explains Ahmed, a fellow traveller we meet in a hotel lobby. And indeed in Jordan a growing number of women wear black veils that leave only a small slit for the eyes open. It seemed to us that the (pseudo) Islamist backlash against “Westernisation” has strengthened macho ideology that reduces opportunities and respect for women much more than in either Western or traditional Islamic societies. In comparison, Syria in general is much more conservative than Jordan, but we felt that women (Western as well as local ones) were treated better there and had – within these strict limits of tradition – broader choices than most Jordanian women. The rapid economic development of Jordan has induced numerous foreign workers to try their luck in the country. Malaysian and Philippino women work in the hotels, and we met many Egyptians glad to earn more money than at home. “There are also hundreds of Chinese workers in the Chinese-owned factories in Amman,” one of them told us. “Jordan is a good place to work – but Egypt is where I want to live!” We have now moved on to Egypt and spent the last few days at the Red Sea coast in Dahab, one of those mixtures between travellers’ paradise and small-town rip-off. Just arrived in Cairo for our visa business, we are curious how the country has changed since our first visit seven years ago. „...and you know, we could also try – ouhh!“ Natascha suddenly stops. Between the high vertical walls of the gorge we catch the first glimpse of the pink classicistic facade of Al-Khazneh, the “treasure house”, a 2000-year-old tomb, carved out of the sandstone over a height of 40 m. When we started this morning we had been full of anticipation to see the famous rose-red city of Petra. But from our hotel to the ticket office it was a 2 km downhill walk, and then another kilometre until we reached the Siq, the narrow winding passage through a rock barrier blocking the entrance to the valley. By the time we had passed through this 1200 m long corridor our anticipation had given way to another discussion how we could possibly cross Libya. Although numerous promotion leaflets and posters had prepared us for this sight we were stunned when the famous view appeared without any “50 m to Al-Khazneh” warning. Before the Romans conquered the area in the 1st century AD, the Nabateans, an Arab tribe of caravan traders, controlled the important trade routes for frankincense and myrrh. These resins from trees that only grow in the Southern part of the Arab peninsula and in Somalia were in high demand in the pagan cults of the European antique. Accordingly, the Nabateans grew rich, and they chose this valley concealed from the outside world to build their capital city of Petra. Although they had originally been nomads, their monuments were made to last: hundreds of grave chambers hewn from the soft rocks and decorated with opulent facades. Nabatean engineers diverted a river through an enormous tunnel to ward off flash floods and flattened the top of a 1035 m high mountain to build a high altar for sacrifices. Their main achievement, however, was to construct an elaborate system of water channels and cisterns to collect every drop of rainwater, thus enabling life and even agriculture in this extremely arid climate. Today, gaping tourists are the main source of income in the region. 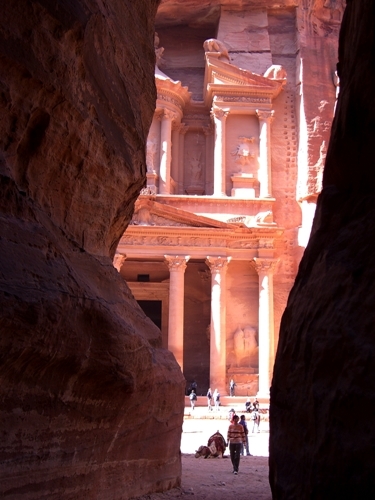 About 1000 people per day visit Petra, even in the off-season, and it stands a fair chance of being chosen as one of the “Seven New Wonders of the World”. Most of the tourists come for a day trip from the cruise ships that harbour in nearby Aqaba twice per week. “You want to ride camel? Cheap price! How much would you pay?” The young Bedouin guys offering their services have pomaded hair and wear fake designer Jeans and mirrored sunglasses. “I was born in a cave nearby,” every one of them insists. This is also what Dak tells us. Dak is running a grocery shop in the village but likes to recount his life in the United States. In the 1950s he emigrated to Kansas, where he soon found a job in a meat factory. “I’m a Bedouin, I know about animals! Give me a cow, and I make it into little pieces!” He was naturalized in the early 1960s and after a spell in Vietnam Army provisions (“I’m a Muslim, I can’t kill people”) he worked as an Army scout in the Texan desert looking for illegal immigrants. Skilled in reading tracks he soon was the leader of a 6 person unit. With his American pension he returned to Jordan to sell us tomatoes at twice the normal price. “Cheap price” he grins, knowing well that everything in this village costs four times as much for tourists as for the locals. We spent 4 days exploring the ancient city. After seeing the main tourist attractions – among them the Siq and El-Khazneh, the theatre, the Royal tombs, the Great Temple and a huge structure called “the monastery” that may have been a temple – we moved to more distant and less visited sites. One day we scrambled through a narrow gorge that looked like scenery out of “Dr Caligari,” another day we hiked up to Jebel Haroun, the mountain where Mose’s brother Aaron is buried. On a steep rock called Umm el-Biyara we met only a herd of goats but had a beautiful view over the pink ruins. In the evening of our last day, when we walk back through the Siq in an exhausted procession of tourists, the foul-smelling refuse collection car passes us. A Japanese woman ahead of us reaches for her handkerchief to cover her mouth and nose and grabs her friend by the arm to draw her to the edge of the path. For here the ravine is only a few meters wide, and the rubbish left by tourists in this beautiful rose city requires a big truck every day. „This Roman,“ the withered old caretaker mumbles from behind his red and white chequered scarf and points his staff to a Maltese cross above the stone arch. Roman? We are on a tour of small castles built by the Muslim Umayyad rulers in the Eastern desert of Jordan. The exact purpose of these desert castles is not quite established. Possible explanations range from “Bonding with Bedouins” over “Pleasure parlours for Umayyad princes” to “Agricultural Management”. But quite a number of these castles stand on former Roman sites, and the Umayyads have reused the building material. Part of the “Limes Arabicus,” a huge border wall like the German Limes, the Roman forts were built to fence off the barbarians at the Eastern outskirts of the Empire, in this case the Arab tribes from the desert. For months now we have been visiting Roman forts and settlements with Roman theatres, Roman temples, Roman colonnaded streets and, yes, Roman churches. For the area became part of the Eastern empire when Rome was divided in the 3rd century, and continued to prosper well into the 7th century AD under Byzantine rule. Thus, “Roman” in Syria and Jordan often also means “Byzantine”. 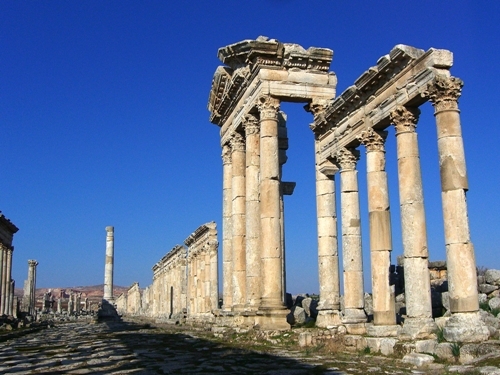 Many provincial Roman towns in the Middle East, like Jerash, Umm Qais or Apameia, but also Aspendos or Perge in Turkey, experienced their prime in the 2nd and 3rd centuries AD, when rich citizens donated whole temples and theatres. Palmyra, a trading town on the Silk Road to Persia, was so powerful in the 3rd century that its queen Zenobia tried to overthrow the Roman emperor Aurelian (unsuccessfully). For five years her realm spanned from what today is Armenia to Northern Africa. Often, the remains of these towns are neither architecturally unique nor particularly artful. After all, they were provincial towns in the far corners of the “civilised world”. Buildings were copied from a Roman standard model, statues of emperors mass produced from a plaster copy shipped in from Rome. What makes the towns so stunning is their state of preservation: We wander along the old main streets with pedestrian areas and beautiful colonnades going onto shopping arcades. In the stone slabs of the street pavement, the ancient ruts are still visible. From huge squares or forums, imposing steps lead up to largely restored temples; the public bath has a damaged mosaic floor, and some sales counters are still in place in the round food market. Some of the theatres, like Aspendos, Bosra and Jerash, are very well restored and used for performances in summer. Even in the 6th or 7th centuries, which we think of as “dark ages” because not much remains in Europe from that time, numerous small towns in the east prospered from their trade in wine and olives. By then, they were full of churches, as most inhabitants had become Christians, but columns, capitals and mosaics still dominated the building style. “Look,” a young would-be guide shows us an acanthus leaf: “It’s called Korintin. That’s why these capitals on the cathedral are Korintins, but those over there are Ionians.” We look at the row of Corinthian capitals and think of our history textbooks, where the Roman Empire was just a pink blot on a map, even if it filled almost an entire page. But with the opulence of these provincial towns in mind, we can now imagine far better than any Eyewitness Guide reconstruction can show how fabulous the antique Rome must have been like.